Polished 304 & 316 Stainless Steel bolts for your Hot Rod, Kustom, Street Machine, Dragster, Race Car, Restored Car, Motor Cycle, bike, pretty much anything you want to show off and look real cool. We have two ranges to offer, we have our standard range of polished 316 bolts which have chrome like finish only brighter and they will not rust up like a chrome bolt can. Our polishing process gets right down into the socket head of the bolt for a real cool look that hand polishing cannot get and ours have a harder surface finish that is very hard to scratch. The choice is yours, for a bright looking bolt that stands out against all colour back grounds our standard range of polished 304 & 316 stainless steel bolts is the go. If you want that mirror like finish then our premium range MirrorTopz[TM] is for you however you should be aware that the mirror type finish tends to reflect what ever colours are surrounding the bolt, even though when viewed in your hand the mirror finish looks shinier than the other. So if you are expecting the mirror polished bolts to stand out more than our standard 304 & 316 polished bolts once they are installed, you may well be disapointed. It is all about the look you want to achieve, MirrorTopz[TM] have that classy deep look to them while our standard range are bright and in ya' face. 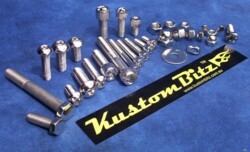 One thing we can assure you of is that even when your pride and joy needs another paint job, it won't need new polished bolts if you have installed Kustom Bitz polished stainless steel bolts, they will still look great. At most all they would need is a hand polish, even if you have never cleaned them.